Last month (December 2012) we discussed methods for modifying soil drainage. We end our soil series by considering the soil as a functioning ecosystem, with implications for the home gardener. A soil in good condition for growing crops, garden vegetables and other plants is said to have ‘good tilth’. It has the proper soil structure and nutrients to support healthy plant growth. Good farmers and gardeners aspire to have soil with good tilth. A soil with good tilth has a proper balance of mineral particles, air, water and organic material. It smells good – not sour or rotten. Often it will crumble easily in the hand. It contains decomposing matter (humus) derived from mulch, dead leaves/branches and old roots. And it supports a wide range of life from gophers and earthworms to microscopic organisms – the soil biota. The soil is, in fact, a living ecosystem, complete with carnivores (meat eaters), plant eaters (herbivores), decomposers and parasites. What many people assume is ‘just mineral soil’ is a whole world of living creatures. The air, water and mineral components of soil provide food, living sites and other requirements for life. Plants are just one part – albeit and important one - of this ecosystem. In nature, soil organisms perform many important tasks. For example, earthworms burrow into the soil, loosening it and making it more porous. This helps water to infiltrate and makes it easier for plant roots to grow. When we ‘loosen’ the soil before planting, we do what earthworms do in natural soil ecosystems. If we ‘double dig’ a vegetable garden, we mimic the effects of energetic gophers at work in our garden. How much easier – and more in tune with natural cycles – to encourage soil organisms to do the tasks they were meant to do. It’s time we take seriously the health of our garden soil biota and its effect on garden plants. Fortunately, recent research suggests several things you can do to promote soil health. Soil tilth is affected by many factors including soil compaction, how much we dig/turn the soil, the fertilizers and other products we apply and physical factors like rainfall and temperature. But perhaps the most important factor is the organic part: the humus and the living organisms. According to soil science research  ‘An acre of living soil can contain 900 pounds of earthworms, 2400 pounds of fungi, 1500 pounds of bacteria, 133 pounds of protozoa, 890 pounds of arthropods and algae, and even small mammals in some cases.’ That’s a whole lot of living going on beneath the ground! Soil Arthropods (insects, mites, spiders, springtails, & millipedes) : 100-300 per cubic ft – you should see some small Arthropods in your sample. We’ve included several good references at the end of this post. They provide more details on soil organisms and their roles. We hope you’ll want to learn more! If your garden is new, you may not have seen many organisms in your scoop of soil. This should not alarm you – the numbers and types of soil organisms tend to increase as a garden matures. Soil building takes time. But there are several good, scientifically-based management practices that can make your soil more hospitable to soil organisms. We suggest you follow these practices to increase your soil tilth. Add organic matter (compost) to the vegetable garden. This provides food for many soil decomposers. The humus produced will increase soil structure and fertility. If gardening with California native plants, be sure that your plants do not require a ‘nutrient-poor soil’ before adding organic material. See our November 2012 post on ‘Soil Amendments’. Use mulch (if appropriate). Mulches help keep soil moisture and temperature even, providing better habitat. Organic mulches break down, supplying organic food for decomposers. 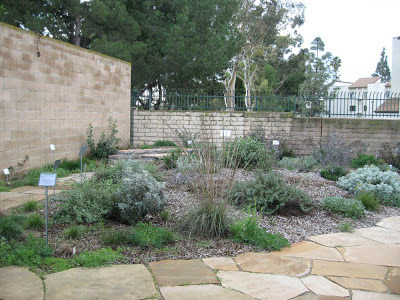 Be sure to use the correct type of mulch, particularly if gardening with California native and other water-wise plants (see our posting on Mulches – July 2012). Water appropriately. The lives of native soil organisms are tied to the moisture cycles that occur in nature. In our local gardens, soil organisms ‘expect’ adequate soil moisture from late fall through spring. But they are adapted to periods of drought in summer and fall. Plant native plants – and water them appropriately – and you’ll supply the water regimen local soil organisms need. We’ll provide more advice about soil moisture and irrigation this spring. Plant native plants. 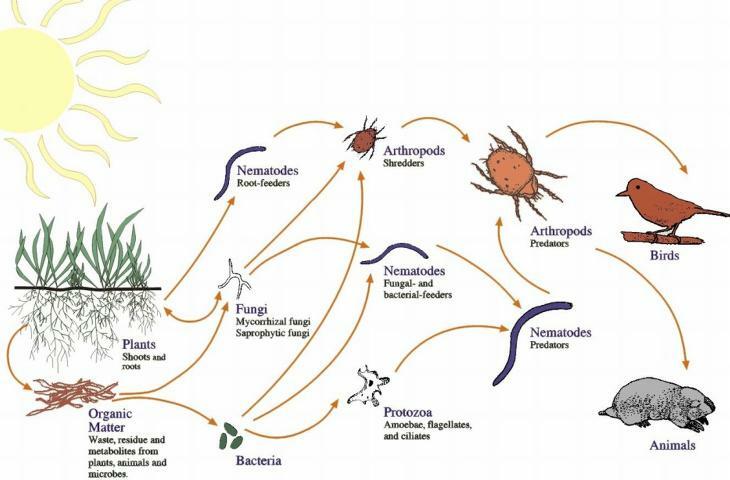 Plants and soil organisms have complex relationships that are not entirely understood. The more native plants you include in your garden, the better the habitat for native soil organisms. Choose plants that are native to your area and reap the benefits in healthy soil. Avoid unnecessary digging, turning or tilling of soil. All of these effect soil structure and adversely affect soil habitat. The best soil for soil organisms is one that’s simply left alone. Prevent soil compaction. Soil compaction decreases soil pores and the water and air they contain. Provide walkways in the garden to limit compaction. Avoid walking on clay soils when wet. Limit use of pesticides. Many kill beneficial organisms along with the pests. And beneficial soil organisms often eat pest organisms for food. Limit use of fertilizers. These amendments change the chemical environment of the soil. Research has shown that over-use of fertilizers actually decreases soil biota in many soils. Southern California gardeners in particular should use chemical fertilizers with care. Plant a variety of plants (diversify); rotate plants in the vegetable garden. Planting a variety of plants insures that soil organisms obtain the nutrients and other materials needed for life. It also provides insurance against the effects of soil pests and diseases. Rotating vegetable crops helps prevent the buildup of unwanted soil organisms. Respect your soil as a complex ecosystem. Remember that your soil supports a living system every bit as complex as above-ground ecosystems. Building up a range of soil organisms takes time, patience and working with Mother Nature. But the benefits to your garden include increased plant health, less time spent on gardening tasks and the conservation of important soil organisms. We hope you’ll choose to support life – including life that you cannot see - in your garden. 1. Pimentel, D. et al. 1995. Environmental and economic costs of soil erosion and conservation benefits. Science. Vol. 267, No. 24. p. 1117-1122. You can now download pdf versions of Mother Nature's Gardening brochures. See the link on the right side of the page. Some of the loveliest wildflowers in the world come from California. In the 1800’s, our local wildflowers became an overnight sensation when planted in European gardens. Their unique charm and beauty still enchants gardeners the world over. To add a special touch to your own garden, consider planting some California native wildflowers. Most of our native wildflowers are annuals - plants that complete their life cycle in a single growing season. Local annuals are uniquely suited to our mediterranean climate. Most sprout with the winter rains, bloom in spring or early summer, then produce seeds and die by the time summer’s heat descends. A few well-known native wildflowers, like the California Poppy, are really perennials. They die back to a sturdy root in summer and re-emerge the following spring, allowing them to survive our long, dry summer-fall. Most annual wildflowers produce abundant seeds, allowing them to reproduce even in our challenging climate. The seeds of most annual wildflowers are good food. Some are still collected, parched and eaten by Native Californians. They impart their unique flavors to any dish to which they are added. Birds also relish the nutritious seeds, so wildflowers attract seed-eating birds. Planting annual wildflowers is a good way to make your garden more life-friendly. Annual wildflowers can be easily and inexpensively grown from seed. 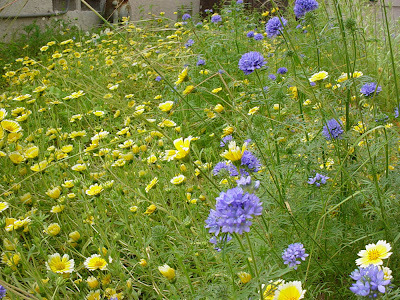 It’s important to plant California native wildflowers; packets of generic ‘wildflower seeds’ from many nurseries contain non-natives that often don’t do well here. If you purchase seeds from reputable sources (see below) you’ll know you’re planting true California natives. 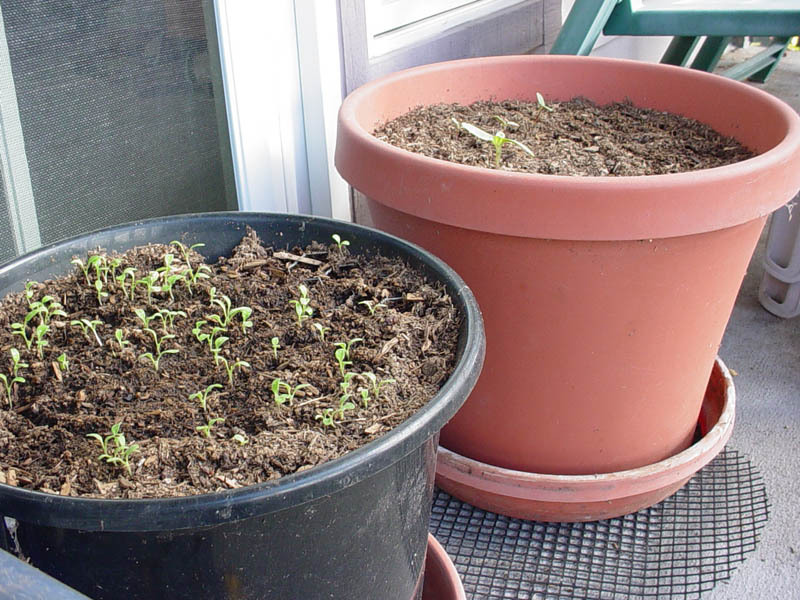 · Plant seeds either in the ground or in containers. · Purchase seed from reputable dealers (see below). Consider purchasing packets of individual species, then make your own special blend. · Plant during the cool, rainy season – December to February in most years. · Prepare the soil before planting by gently raking it. You may also want to spread a 1 inch layer of gravel over soil (prevents birds from eating the seeds). · Plant seeds just before a good rain. You can mix the seeds with dry sand to help you spread them evenly. One teaspoon of seeds covers about 4-6 square feet. · Watch for seedlings to emerge – usually within 2-3 weeks. Water the soil if it starts to dry out. · Keep the soil moist until plants have finished flowering. Then taper off watering, letting the seeds mature/dry. · Collect dry seeds, dry in paper bags and store in a cool dry place for next year – or let plants re-seed naturally.